Once again the Orchard and our neighbours, Hazel Orme Kindy, combine for an end of your community event and fundraiser. The Orchard shed 'stage' will feature local music including Voicemale, Fremantle-based bunch of blokes who will sing anything from ACDC to Georgian round dances. There will be food stalls, craft activities and spin the wheel - spin till you win. Celebrate the longest night of the year with neighbours, friends and family! Afternoon Tea: Please BYO a plate of food for the “Table of Afternoon Tea Delights”. First we feast and then we walk! Our second busy bee of 2018 is scheduled for Sunday April 8th 3:30 - 5pm and a seedlings sale too to raise much needed orchard funds. There will be some fruity options for your yard - banana palms, ice-cream bean and some interesting understory seedlings including yacon and river mint. The busy bee tasks will be diverse from planting understory seedlings to pruning the banana palms. All welcome. A big fundraiser event for the Kindy was shared this year with the Orchard and both sites were open for different activities. The Orchard hosted the free entertainment with an excellent lineup of live music all afternoon, a whip cracker and nature mosaic for young and old and fresh food. The community art project is complete so time to celebrate and thanks Lynne Tinley, our local artist who led this project and created 4 separate art pieces on canvas, doors and shutters of our shed...plus some delightful magpies from Ken. Everyone is welcome. Come and help us develop the Orchard vision and get some fruit and nut trees in the ground on our Samson St boundary plus some understory seedlings. Bring a digging tool and wheelbarrow if you have one. Come & celebrate the longest night of the year with friends, family and neighbours as we light the Valley for the 5th Annual Winter Solstice Lantern Walk on Tuesday 20th June. Lantern making at Sullivan Hall for all ages and skills will be happening from 3.30pm so come down & get creative. You can pick from a kid friendly, beautifully simple paper and string option, or be a bit more ambitious with bark, recycled rope fibre & sticks! Starting from Sullivan Hall we'll walk together at 6pm before having a shared feast from 6.30pm. Bring a plate of your favourite food to share. Four on Six will be playing whilst we feast and delighting us with their incredible Gypsy Jazz inspired tunes. Led by experienced home composter, Zoe Williamson, learn how to hot and cold compost your vegie scraps at home, while getting some hands on experience in our Orchard . In this month as the olives ripen, we are putting on an afternoon workshop on olives for oil and olive curing and marinating, presented by Teresa with family and friends. Learn about the humble olive and watch demos of how to get the best out of them. Set aside Friday night March 24th in your calendar for the Orchard's second Flicks in the Hall. The movie is the British comedy, Grow Your Own, that was inspired by a real project in Liverpool that connected refugees with community gardens. Watch the trailer here. Rated M (coarse language). The movie will be followed by tea, coffee and cake and a dance on Sullivan's sprung floors! Thanks to a sponsorship grant from the City of Fremantle, we are pleased to run a series of workshops starting with this practical session, led by retic expert and WGV local, David Jenkins. Starting at 1 Fisher St, fruit tree expert Peter Coppin will take participant through the ropes of maintaining a healthy, productive citrus tree in your backyard, treating common diseases and insect attack through to how to plant and establish a tree as we plant the citrus grove in the orchard together. Also time to ask Peter some general fruit tree questions. This annual lantern parade at the darkest time of the year is now coupled with a community feast at Sullivan Hall. Bring a lantern to the orchard between 4:30 and 5:30 and join the parade or join the welcoming party at Sullivan Hall and bring a dish for a shared dinner from 6:30 to the sounds of live music. 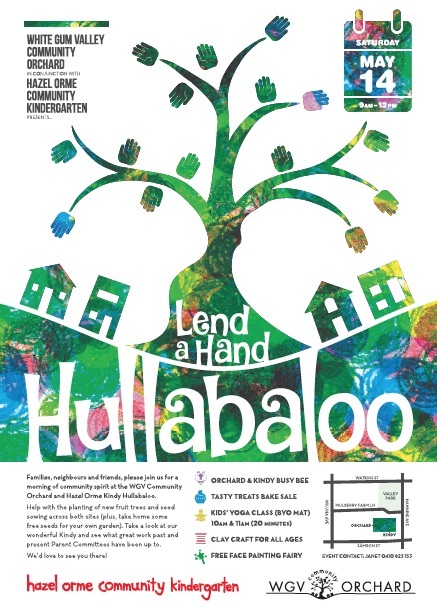 Join us on May 14th Saturday morning from 9am for our big planting Hullabaloo! ​Activities for young and old, live music and a bake sale! Well done to the harvesting team and a big thank you to Teresa and Peter who coordinated our first olive pick and took the load to be pressed. Sullivan Hall was transformed with couches and soft lighting for a showing of "The Castle" followed by a dance. Many thanks to the local Fremantle businesses that supported us through the raffle and donations to our evening in the Hall that raised much needed funds. After a week's postponement we got delightful mid-winter day for planting of the freshly prepared tropical zone (only for the trees to be stolen two weeks later, but we won't dwell on this! ), some lantern making led by our WGV Playgroup partners to the gentle sounds of live music from Tony Saxophoney. It culminated with a brisk lantern parade through the orchard and Valley Park as darkness descended. The Orchard had its official launch as part of the Fremantle Festival on Sunday November 2nd 2014 3:30 - 5:30pm. There was music, mexican icypoles and tortillas, jam making and tasting plates, a welcome to country celebration and the planting of the first 3 trees. We got a terrific response to our fruit tree survey and we thank you all for participating. The results are being incorporated into the selection of fruit trees for the community orchard, along with expert advice on fruit tree choices and siting. We'll keep you posted how this and how you can get involved.